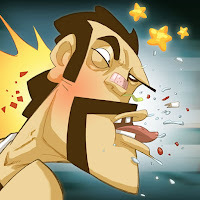 Here's the first version of the Bar Fight app icon that i worked one. Initially we decided to kept it black and white which worked quite well in the end. The second icon was based on the intro page image to Bar Fight. In this version i decided to add a bit of colour to the icon, to give it a little more depth. However, this version was finally binned as we decided the level of detail was too much given the scale in which the icon would be reproduced. This is the third and final version of the app icon. Keeping in mind all the lessons from the previous icons, this one punches straight to the point; and in full colour too! WHAMO! Right in the chops!